Unlike anything else on the market, Wave Shade delivers big on both performance and style. Sleek and durable, Wave Shades feature superior 20MIC anodized coated aluminium parts and polished stainless steel fixings to give a premium appearance that will complement any property. Shade View 300 fabric has an openness factor of just 5%, giving exceptional UV protection, and comes in a wide range of modern colours. Wave Shade retractable shade covers offer property owners a fresh alternative to traditional shade sails that are fixed in place and set in shape. The smooth, shapely billows of the Wave Shade bring an effortless style to outdoor areas, and modern colours let the shade fabric naturally blend in and complement the exisiting style of your property. 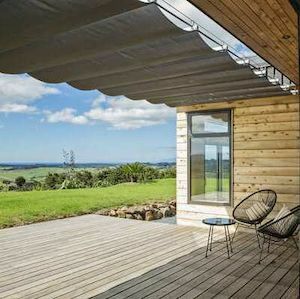 Manufactured in New Zealand from the best quality materials, Wave Shades can be extended and retracted quickly and easily so you can enjoy the open feel or have the shade exactly when you want it.